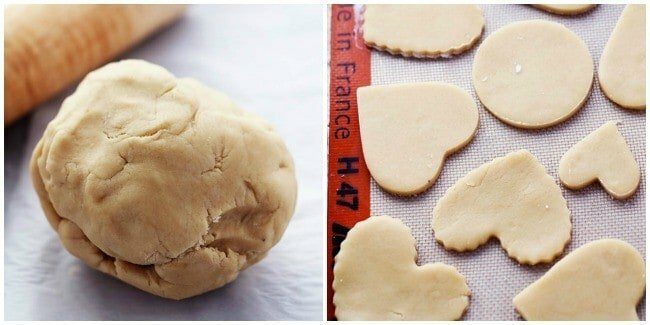 Cut out homemade Sugar Cookies that have a crisp edge and the softest center! Topped with my favorite cream cheese frosting and sprinkles this is a tried and true family sugar cookie recipe! You will agree that they are the BEST! 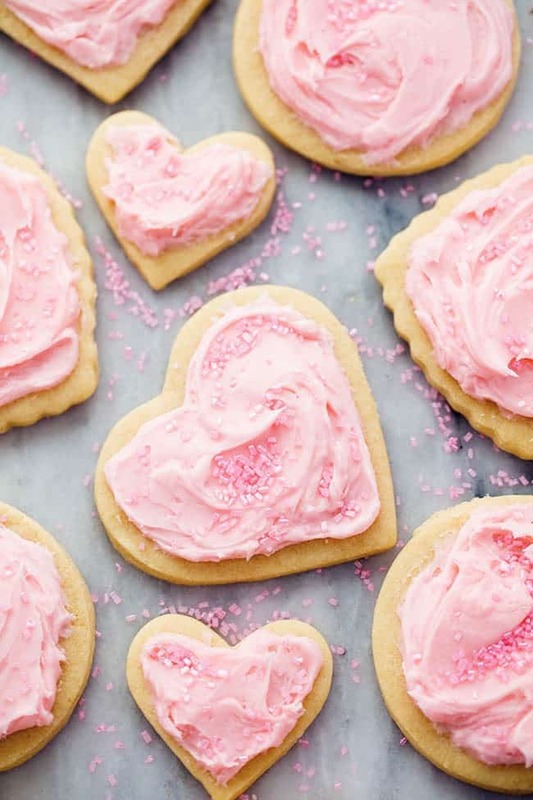 I sure do love sugar cookies! If a neighbor brings me over a plate of sugar cookies with frosting they will instantly become my new BFF. What is it about a fresh baked sugar cookie with frosting that is so delicious? I have had a lot of sugar cookies in my day. Some are way to crisp and not soft enough on the inside. I love this recipe because it is the best of both worlds. A little crisp on the outside, but not too crisp, and they have the softest center! The edges don’t expand while baking and they come out looking in the perfect shape. 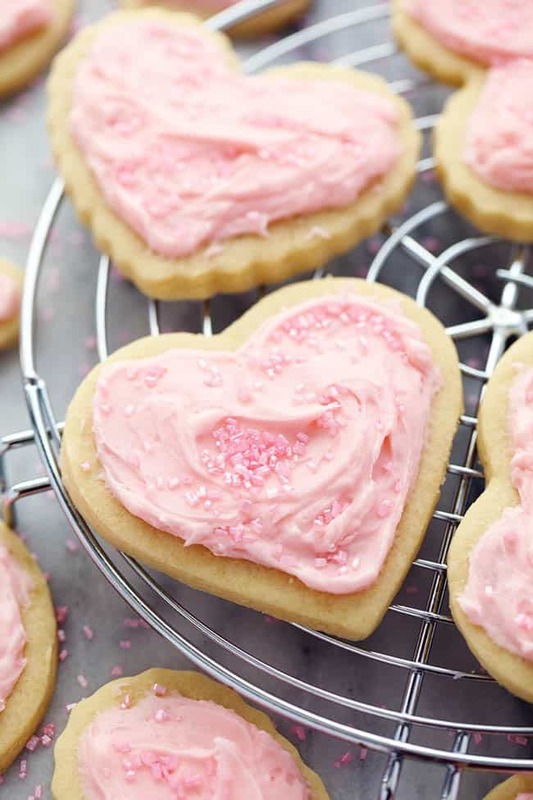 The recipe is a pretty basic and traditional sugar cookie recipe. The dough comes together in a matter of minutes. But I found that the secret to the best sugar cookie is added almond extract. The almond extract add such a rich and delicious almond flavor making them absolutely perfect. In a large bowl beat the butter until smooth and creamy for about one minute. Add the sugar and continue to beat until creamy for about 2 minutes. Add the egg, vanilla, and almond extract and continue to beat until incorporated. In a medium sized bowl, whisk together the flour, baking powder, and salt. Slowly add to the creamed mixture and continue to beat until the dough comes together. Form the dough into a ball and chill in the fridge for one hour and can be chilled overnight. Preheat oven to 350 degrees. Line a large cookie sheet with parchment paper. Roll dough out to desired thickness (mine were 1/4 inch thick) and cut with cookie cutters. Transfer to baking sheet. Bake for 8-11 minutes or until just set. I like mine more soft so I cooked mine for 8 minutes. 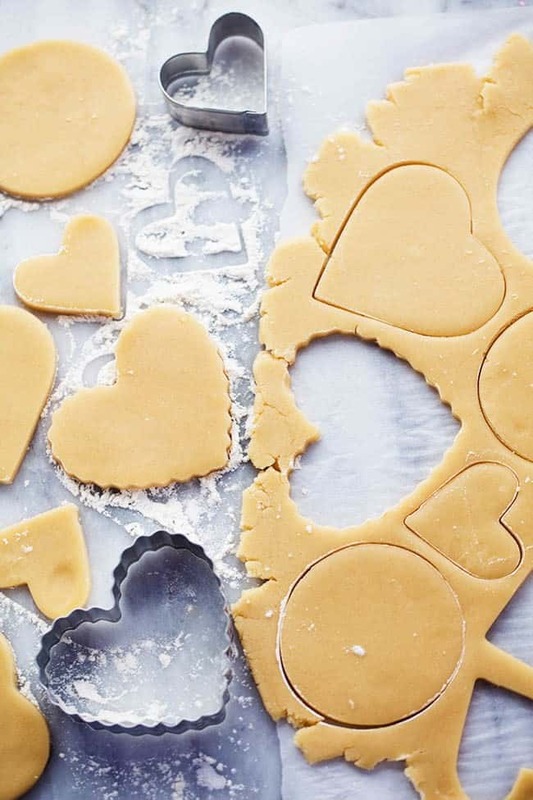 Let cookies cool completely before frosting. To make the cream cheese frosting: Beat together cream cheese and butter until smooth. Add powdered sugar and vanilla and continue to beat until it is smooth and creamy. Frost cooled cookies. Do I have to chill the sugar cookie dough? The dough does require an hour of chilling time. So go change and fold some laundry or get caught up on a netflix show. 🙂 They are ready to be rolled out and cut into perfect and cute sugar cookies. My kids love to help make sugar cookies and we loved spending some time in the kitchen making cookies together. We ate way to many cookies to count and had fun delivering them to friends. How long do sugar cookies last after baking? Store your cookies in an airtight container. They will last for up to a week. These cookies are perfect for your Valentine’s Day festivities and are so good that you will want to make them throughout the year! 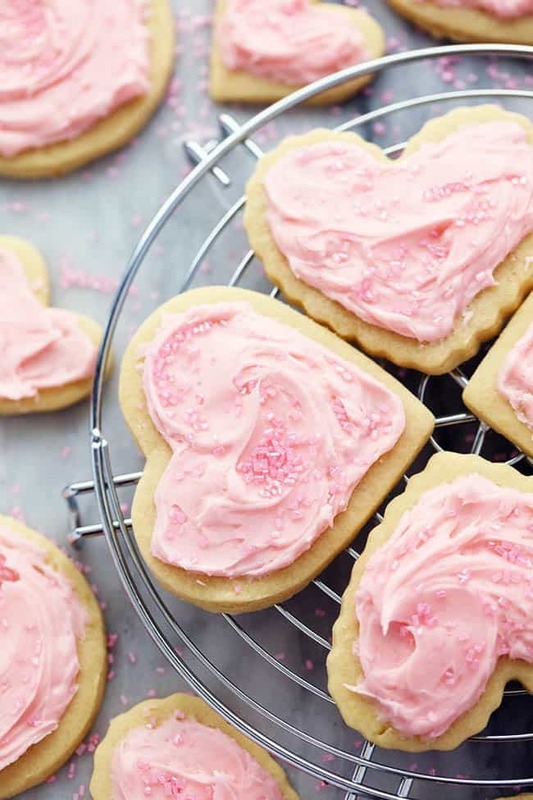 This will become your favorite go to sugar cookie recipe that you will make again and again. You are going to quickly agree that they are the best! Trust me. I made sure by eating at least 3! ? 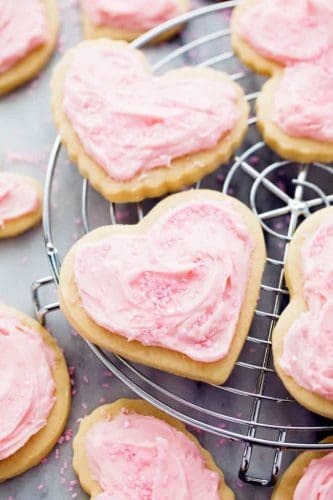 Cut out Sugar Cookies that have a crisp edge and the softest center! Topped with my favorite cream cheese frosting and sprinkles this is a tried and true family recipe! You will agree that they are the BEST! How long do you think the dough will keep in the fridge/freezer? Omg thank you so much for this recipe my family loved it! It was incredibly great❤❤? How does this dough freeze? How well does this dough freeze? Thank you for the recipe! Turned out wonderful! Omg the cookies tasted amazing. This is my new favorite recipe. I definitely give this a ?. Thank you so much. Wonderful cookiesummer! How well does this dough freeze? OMG I LOVE THIS RECIPE!!! ITS SO DELICIOUS AND HAS THE PERFECT FLAVOR! I personally made royal icing to go on top and omg it was da bomb! Thanks so much! Can you stack the cookies after they’re frosted? Do you use real butter? Great recipe! I will say–this made an insane amount of icing. I made 3/4 of the recipe, knowing I don’t like thick icing. I used less than half of what I made. Thanks for the recipe! My daughter and I made these into christmas cookies. Can you hold the sugar cookie dough in frig for a few days or should I freeze it? Maybe I missed it, but how many cookies will this recipe make? Do you use salted butter or unsalted? Thank you! I prefer unsalted butter but salted butter will be great too in these cookies. And do you let them cool on the baking sheet or transfer to wire racks for cooling? Thanks! Hello. I’m making these for the first time, and so far, so good. However, I won’t be frosting them until tomorrow, but I already made the frosting. Can I leave the frosting in the fridge overnight? IS there anything I can use instead of the almond extract (nut allergy)? Yes, of course! It just adds a great flavor. Almond extract is great to if you need a substitute. HOW DO YOU GET THESE TO COME OUT CRISPY ALL THE WAY THROUGH—NOT SURE BUT I THINK MY MOM LEFT THEM IN THE REFRIG. OVERNIGHT AND THATS HOW I THINK THEY WERE SO CRISPY AND TASTED SO GOOD WITH COFFEE—WHAT TO DO??? This has now become my go to sugar cookie recipe it’s absolutely delicious. So soft yet crispy. Look forward to trying out your other recipes. Very good sugar cookie following recipe precisely. Mine needed more baking time to have a golden finish on the bottom, but still have a soft inside. About 12 minutes. Frosting was a huge waste producing 3X amount needed for basic (one color) frosting. Degrees can be referred to Celsius or Fahrenheit. If you bake a lot of cookies, you would know that 350 is referred to Fahrenheit. UCan I substitute lemon extract or strawberry extract instead of almond extract? These sound excellent! Does the icing get hard enough that you can stack them? With cream cheese in the icing, do they need to be refrigerated? Once they are thawed they are still soft! So delicious! May i use vanilla extract instead of almond? Yes! That is delicious too! Do you have to refrigerate the cookie once it’s frosted? You can! I just store in an air tight container and they last a few days. Truly my idea of the perfect sugar cookie. These cookies are best!! I am glad that you like them! A question on the oven setting. Is the degrees celsius or fahrenheit? Also, is the oven on fan forced? Fahrenheit and not on fan forced. I just tried your recipe with my daughter and they are awesome. The taste and texture are perfect. Definitely will do these for her birthday party in July. Thank you for sharing. To change it up, could you substitute lemon extract for the almond extract? If so, would you still use the vanilla? Thanks for sharing all your great stuff..